Its taken me awhile to transition back to my normal routine here in the states (I just returned from 3 months in Oaxaca, Mexico). I’ve picked up the old routines again, gradually. I’m now back to doing my adult literacy tutoring on Tuesdays and Thursday afternoons. Hubs and I have date night on Fridays. We’ve got books checked out from the library etc. When we returned home, we found that our water heater was leaking, so we’ve gotten that fixed. We’ve caught up on laundry and I spent some time cleaning up my studio. The clean studio inspired me to create. When it is a mess, I feel .paralyzed. Mind you, the whole room isn’t clean yet, but there is space at my work table to create and so I did. I’ve joined a group that is participating in a webinar series called “set yo space“. It will focus on how to create an inviting studio space that inspires us to create, rather than having a space that paralyzes our muse. I’ll write more about that, once we get going next week. It’s a beautiful day in the Pacific Northwest. Flowers are blooming, the sun is shining and I feel happy. So I decided that a good name for the new earrings would be “Springtime Celebration”. Its how I feel. The shield-shaped copper pieces were created by my good friend Kristi Bowman. She colored them in the most amazing jewel-tones. Love! I topped them with some silver lined, turquoise glass beads and wove some hand-dyed ribbon above them. Kristi shared some her customer’s recent work on her blog today, including these earrings. You should check her blog post out. All the jewelry is just yummy! The Spring Time Celebration Earrings are available on my website now. Bonus picture, just because I love flowers! 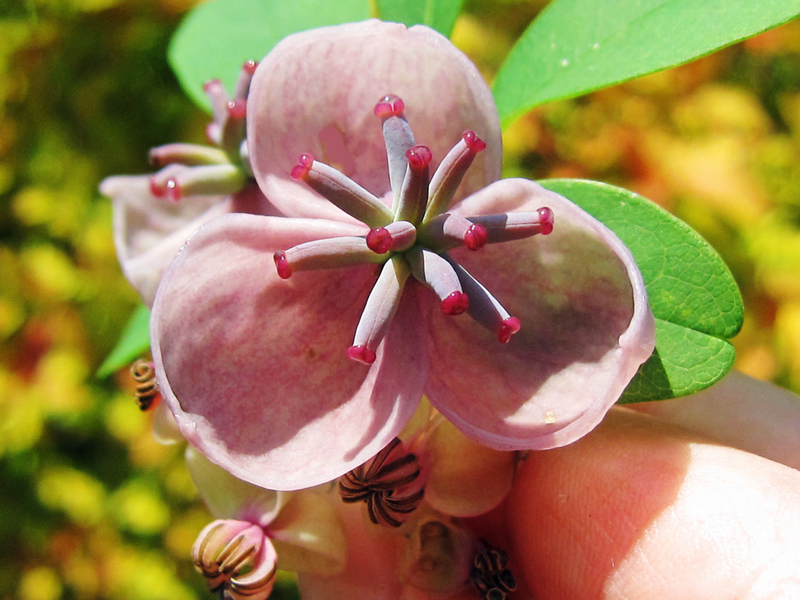 This is an Akebia bloom from our backyard. This entry was posted in Art Beads and Components, Jewelry and tagged Art Beads, artisan jewelry, earrings, handmade jewelry, Kristi Bowman, Kristi Bowman Design, Linda Landig Jewelry by Linda Landig. Bookmark the permalink. Thanks so much Linda!! I adore what you did with these components, such a beautiful pair of earrings!!! When my muse has gone missing, using your copper components is a good way to get her to show up again! Yeah for springtime! It has finally arrived in my little corner of the world as well. Those earrings are fantastic and love the colors – especially that ribbon!